The gaming industry is changing at a rapid pace. Government regulations and evolving demographics have the potential to impact our local economy and significantly change the landscape as we know it today. 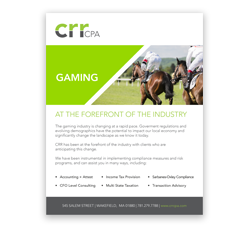 CRR is at the forefront of the industry, with clients who are anticipating this change. We can help you implement compliance measures, mitigate risk, and manage your finances more effectively.